Incredibly realistic rusting on the business ends of the weapons. How did you manage to get that effect? Thanks! For the rust I painted the blade in Vallejo Natural Steel. Then I washed it with Games Workshop's Typhus Corrosion (one of their special effects paints). You could also use Vallejo Smoke or a brown ink. 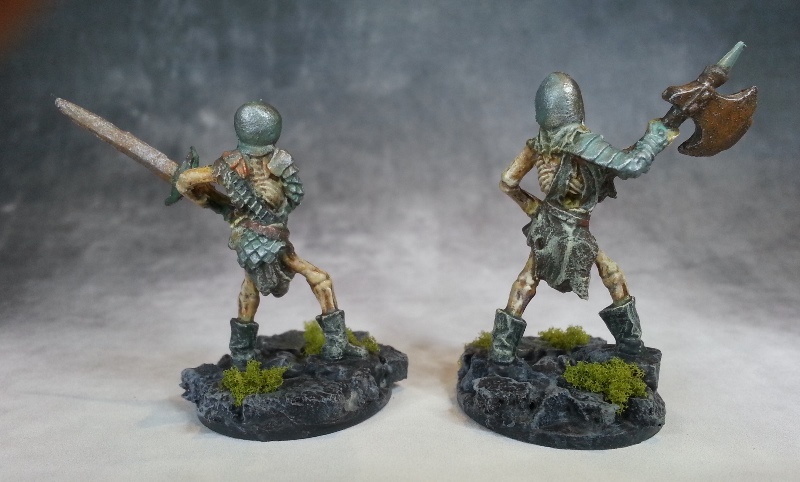 Then I stipple over that with Games Workshop's Ryza Rust,another special effect paint. But any bright orange paint would do. 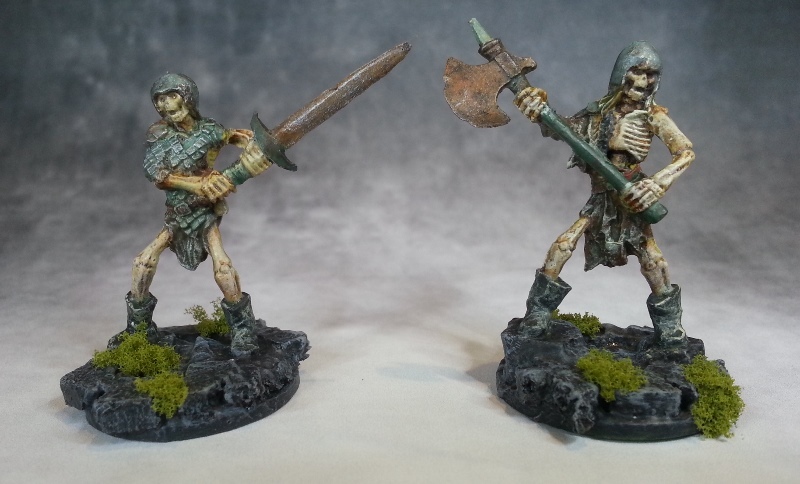 Then I add a really light drybrush of the original metallic paint just so there's a few hints of that colour showing. That's fantastic, you've shown me paints that I wasn't even aware of. (It happens a lot here) Will you be adding it to the armor as well? I did the armor a bit differently to the weapons. The armor, shield and some accents on the weapons were painted bronze then washed with yet another games workshop paint ... Nihilakh Oxide ... to give a verdigris effect. Purely because I thought it would more interesting than having all the metal being rusty steel. Very nicely done, they have a very old feel to them! You know, I don't think I've ever gone to that trouble for a mere skeleton. Beauty! Definitely a fine bit of artwork. 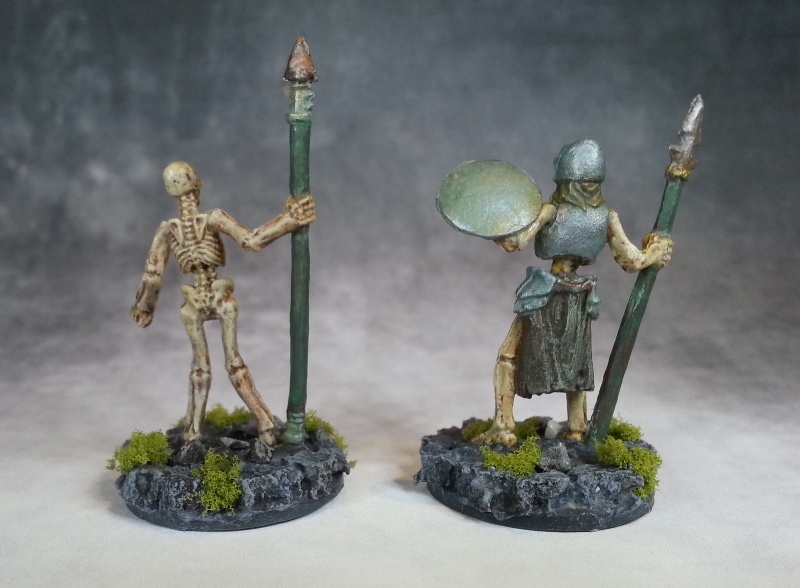 These days most skeletons look like they're fresh off the lot and have better equipment than the adventurers, these ones look like they came from a shady used undead dealership. Great work on the models. The bases look awesome.